Swinging at the PBC with Hetty Kate and Ian Date (4th December 2013). 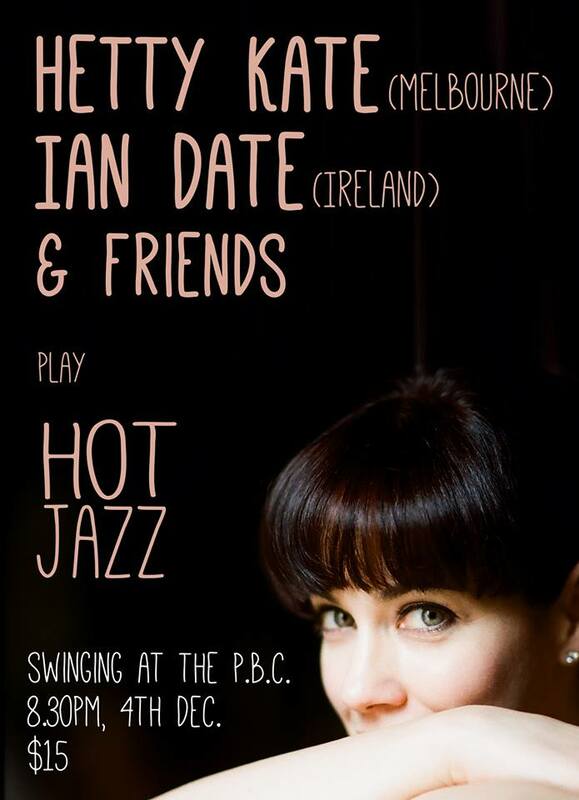 Next party: Swinging at the PBC with Hetty Kate and Ian Date (4th December 2013). It's the end of the year, and we're going out with a BANG at the Petersham Bowling Club. Hetty Kate is in town, she likes dancers and we like her, so we're having a party. But even better, Ian Date is ALSO in town, and he doesn't know he likes dancers yet, so we're going to convince him! 8.00pm Live music with Hetty Kate (vocals), Ian Date (guitar), Natalie Morrison (bass), John Morrison (drums). The dancers' darling, Hetty Kate has sung at pretty much every Australian lindy hop and blues event in the country: MLX, MSF, Canberrang, Jumptown Jam, Southern Blues, BBS, SLX... She's just recorded an album with THE Gordon Webster and she swings like a gate. Check out her music here. Now based in Ireland, Ian is one of the 'Date Brothers': jazz guitar MONSTERS. Well, more gypsy jazz fiends than monsters, Ian Date is one of Australia's best jazz guitarists. He also swings like a gate. Check out his music here (Jive At Five and Blue Lou are especially good).